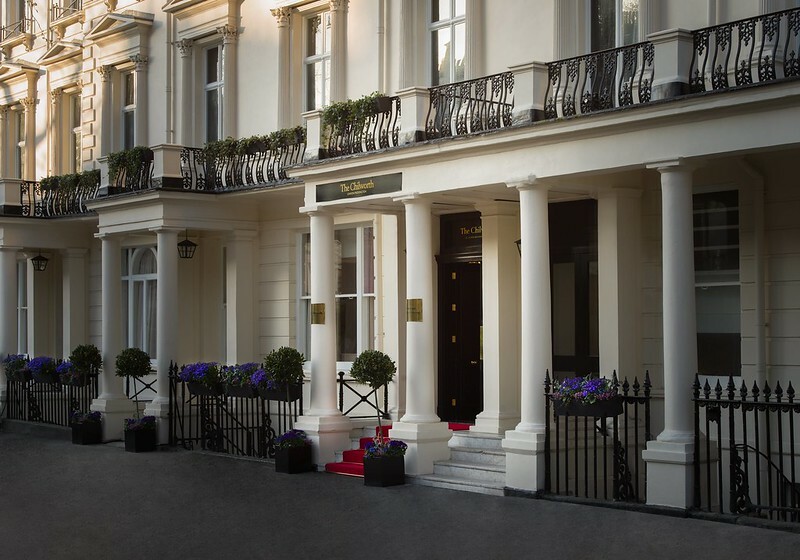 The Chilworth is Montcalm Hotel Group’s first townhouse hotel, and is a rebranding of an existing hotel – the Shaftesbury Premier London Paddington. It is aimed to “offer a new more intimate Montcalm experience” and opened in July 2018. The hotel is set back slightly from the main road, and is in the middle of a long stucco terrace heading north and south. Reception is up a couple of steps and once I had pushed open the doors there was a small reception area with a concierge desk to one side, a few seats and beyond that sight of the restaurant and bar. I arrived in the early afternoon, so it wasn’t too busy, and I was quickly checked in and told a few pieces of essential information such as the time for breakfast as well as being asked if I needed a wake-up call the following morning. There is one elevator which serves all five floors. It is quite slow so I waited for it to come up from the basement and then went up to the fourth floor room. Thereafter I used the stairs every time I wanted to go up or come down. There were always people waiting for the lift. It’s obvious that money has been spent in renovating the hotel, but it is still noticeable that this is a conversion of an existing building, so the upper floor corridors are narrow and you can hear the noise from neighbouring rooms and particularly the room above (creaking floorboards). On Westbourne Terrace which is about a five-minute walk from both Paddington Station and Paddington underground station, along with Ladbroke Grove Station. It is convenient for both Heathrow (via the Heathrow Express and Heathrow Connect) and most areas in town, and is about a ten-minute walk from Edgware Road. The 124 rooms are in a number of different categories. All have a room a safe, complimentary toiletries, a Handy Phone for international free calls and data roaming, tea and coffee making, mini-bar, a selection of magazines, shower, bathrobe, complimentary newspaper, an LCD television, and, weirdly, vitamin-infused showers, which is a first for me and which I don’t understand, but which apparently help to reduce chlorine in the water. The room was clean and furnished with taste without drawing attention to itself. The carpet was grey with a stone pattern of while and pink swirls in it. There was a small workdesk (too small, really) and a sofa running along one wall, though this was because my room was L-shaped and ran around the back of the lift. When I went down to the basement to look at the gym I noticed there were rooms down there as well, so it’s worth checking what you are getting when you book, though of course often rooms such as this can be the quietest. The hotel’s all day restaurant / café has several different elements to it, and is quite confusing. In the morning there is an extensive buffet breakfast available with both hot and cold food (£16.95). There is also a menu of healthy and specialist items including ingredients such as quiona and chia seeds and avocado, but these are only available for additional purchase. Then, during the day there is a menu that is divided into different regional cuisines, presumably to cater for the international guests the hotel caters for. There is also an afternoon tea menu which seemed very popular. Finally, in the evening, the menu changes again to an extremely restricted English pub menu circa 1980, with steak and chips, fish and chips, a chicken dish and pizza. Starters were tomato soup or a house salad, or garlic bread. All of these different meals are served by enthusiastic and friendly staff, but it’s the breakfast I’d recommend if you were going to have one meal in the hotel, though you’d have to inquire what would happen if you didn’t want the buffet but did want the healthy options. Perhaps you get a £16.95 credit against these healthy options. There are no meeting rooms at the hotel. There’s also a compact urban spa complete with a spa bath, gym, steam room and an extensive range of treatments. Another option is to go for a cycle round the nearby park (staff can arrange bikes for hire) or simply go for a run in the morning, which is what I did. This is a full service hotel at an affordable price in a good location, both for travel into Central London and for Paddington’s connections to Heathrow, but also having the benefit of Hyde Park a short walk away. Staff were very attentive, and the refurbishment has certainly added to the charm of the hotel.